This entry was posted on 25/03/2016, 23:15 and is filed under JavaFX, Undecorator. You can follow any responses to this entry through RSS 2.0. You can leave a response, or trackback from your own site. Really nice work! Any plans to put your your library into Maven Central? Thanks for the kind words Carl 🙂 ! For Maven, since I’m not familiar with it, is there a “For dummies” help 😉 ? Arnaud, I’m not very good with maven either. I know enough to be dangerous. You may need to ask others I know how to publish to local maven repos at work, but not maven central. I believe there is some approval process. Usually at my work we can’t download and use libraries unless they are published artifacts on Maven central. first of all i want say that it is a nice work. I implemented it to an private project but i got an problem. 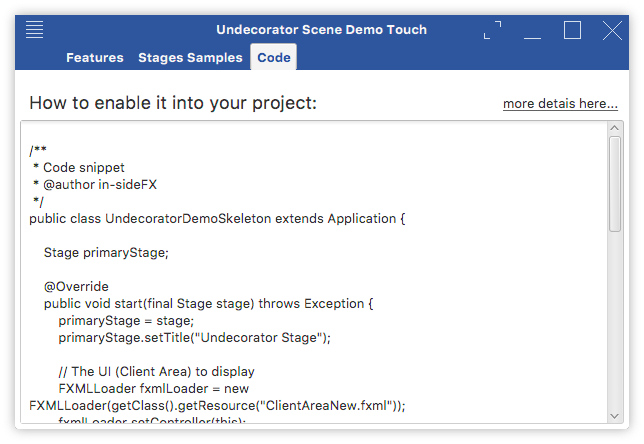 If i need use of the controller class i cant address it from Eclipse to SceneBuilder. javafx.fxml.LoadException: Controller value already specified. The touch theme is impressive. But how do you animate the window when minimizing, maximizing, etc.? It doesn’t animate on windows 10. Thanks for your feedback. I would love to see a screenshot of what you’re doing with it! That’s exactly what I was looking for! I didn’t realize it was already in the Bintray respository – that’ll work fine, thank you. What I want to do is provide an easy way to exclude the menu and/or the minimize/maximize/fullscreen buttons without having to remove them after the fact. If I can get it working, I’d like to contribute my code to the project. Do you accept pull requests? I’ve already posted answers to this kind of request. Generally, you can do it with modifying the code: simply invoke lookup(elementId) and set it as invisible. Let me know if didn’t succeed. And feel free to send pull request! Ugh. I can’t leave a reply to your reply. 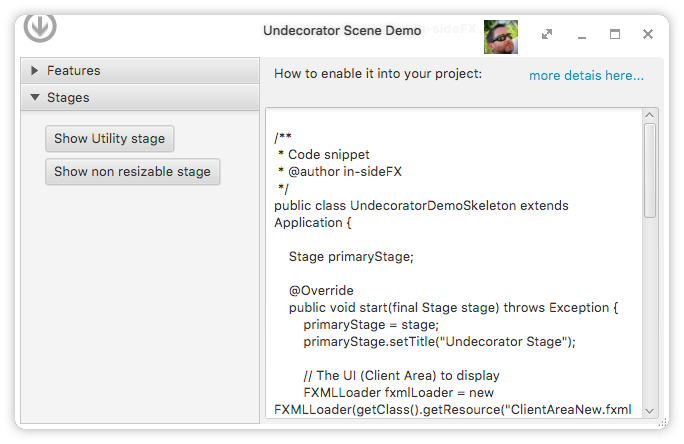 Found an even easier way to make the change I wanted: made a copy of stagedecoration.fxml, edited it, used it instead of the default. The only difficulty is this: if I remove the context menu, I get a NullPointerException. I can guess why, though I haven’t looked at the code yet. If it’s what I think it is, it’ll be easy to fix. I will submit that pull request soon. The problem WAS what I thought. I simply needed to add a check in insidefx.undecorator.Undecorator – when initDecoration() is called, I check whether contextMenu is null, and I only manipulate the menu if it isn’t. I’ll check in the change to my repo and send a pull request.